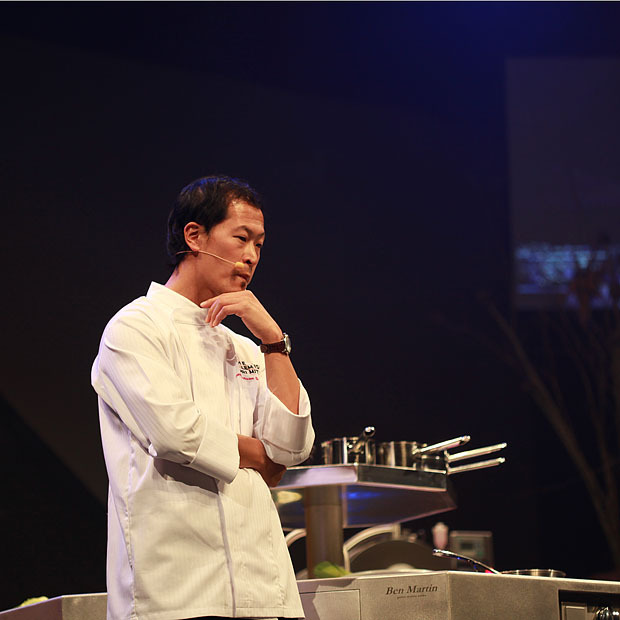 Sang Hoon Degeimbre (chef at L’Air du Temps) on stage at TFP2010. Photo by Piet De Kersgieter. As mentioned in my previous post on The Flemish Primitives 2010 (TFP2010) two chefs had taken their inspiration from Asia. Peter Goossens had come across high pressure processing during a study trip to Japan, and had developed this further in cooperation with Stefan Tí¶pfl. Korean born Sang Hoon Degeimbre (of L’Air du Temps) on the other hand had returned to his roots to study kimchi, the ubiquitious Korean staple food. It is a pickled dish made of vegetables with various seasonings, and it is a very common side dish in Korea. In fact, it’s so common that Koreans say “kimchi” when being photographed, just like we say “cheese” in English.